It’s been a while since I mentioned ‘road running’ with the same passion that I have now for trail running. But lets face it as a Singaporean runner or if you’re based in Singapore, you have to run on the road. Unless you live next to a trail section (Bukit Timah, Macritchie or even the Green Corridor), you will be relegated to the fact that you have to take your training out on the tarmac or stadium track for the majority of the time after office hours or after school. When I started out running half a decade ago, I ran a lot of road races. It may not be a lot to some people nowadays. But back then, my motivation to keep improving was sustained by taking part in races. I remember vividly I had a race almost every other month in 2011! With the surge in popularity of running rising in the last few years, both locally and worldwide, runners these days have a plethora of races they can take part in. However, race registrations in Singapore doesn’t come cheap. I’m sure runners who are still consumers at heart would want to register for a race that has the most bang for buck. Thinking about it now, I did spend quite a bit of money on race registrations in my earlier years. All in one packages didn’t exist back then, so that’s where the NTUC U Run All Access comes in. The running package is exclusive for NTUC / nEbO members (non-members can sign up for a bundle package which includes NTUC / nEbO membership). 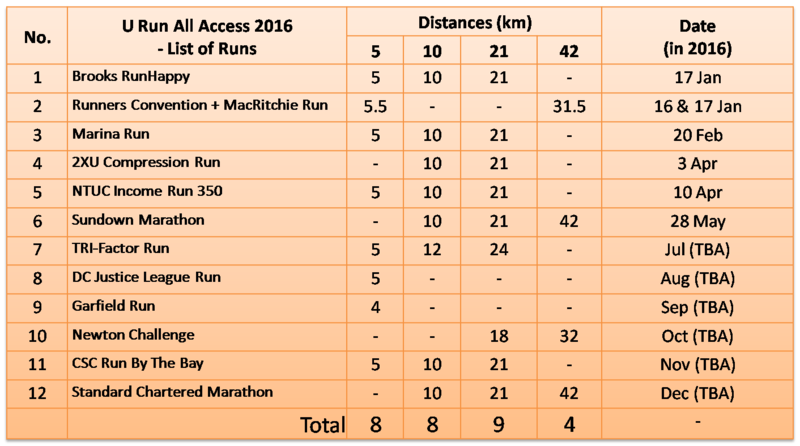 The 3-run package is priced at $158 and allows package holders to enjoy guaranteed slots to 3 of their favourite races available under the ‘List of Runs’ of U Run All Access in 2016. For package holders who wish to run more races, they have the option to purchase additional runs at $50 each. Hassle-free and ease of registration for races: Guaranteed slots for selected race are reserved direct with race organizers when URAA package holders register through the exclusive one-stop credit utilization portal. URAA holders will be notified when a new race is opened for registration and can log in to the portal to utilize their run credits. Attend wide range of workshops coached by specialists and elite runners. Clock mileage / train with fellow runners in the weekly U Sports running sessions led by professionals. Enjoy exclusive privileges & benefits such as hospitality booths @ selected races & more. Here are the list of races that’s available under the All Access. I’m quite happy to see some notable races that I have taken part in the past, such as the 2XU Compression Run, Sundown Marathon and Standard Chartered Marathon. In all, the races are quite well distributed in terms of the distances as well as the type of races they offer (themed runs and what not). For runners who frequent a series of races year in and year out, such as the Standard Chartered Marathon, the Sundown Marathon or even the 2XU Compression, it will certainly be a cost-saving entry to be able take part in this races without having to decide too much on whether one race will cost more than the other. The package also allows runners to mix and match races that they’d like to sign up for, given the reasonable number of races that’s available. I think where the real benefit comes from would be from the training workshops and seminars conducted by the U Sports running groups. It is worth noting that U Sports does collaborate with the team from Train Live Compete, whom I know personally and does a great job training and preparing runners for their race goals. 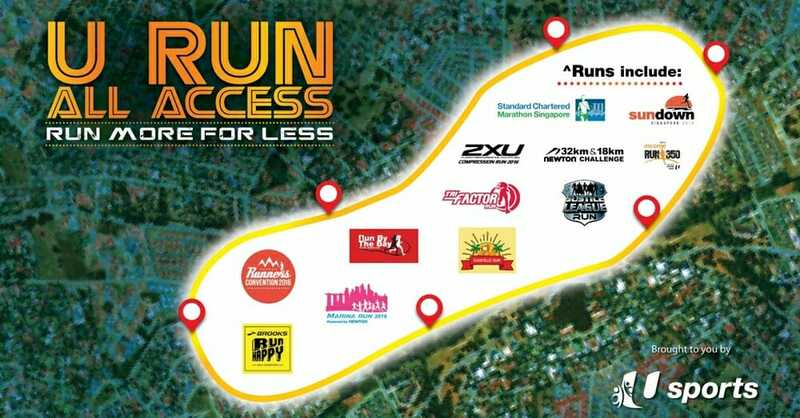 The U Run All Access is now open for online sign up at this link. Disclaimer: I’m not getting paid to write this post, but this is an opinion piece that I’m doing on a request by NTUC Club. Thus the opinions are of my own.